The Jousting Life: Promotional Information About the Upcoming "Tournament of the Phoenix"
Promotional Information About the Upcoming "Tournament of the Phoenix"
"The tournament of the Phoenix™ is a two day, six event sports contest, the original 'extreme' sport. The only event of its kind in the US, it is one of the most prestigious events in the world. It is invitational, and only the most highly skilled competitors are invited to compete for the coveted Phoenix prize. 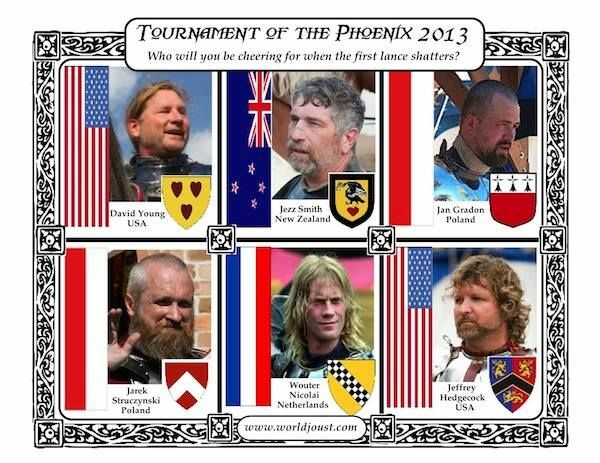 Six knights will compete at the Tournament of the Phoenix 2013. Hailing from the US, England, and Poland,[Editorial note: it actually looks likes there are competitors from the US, Netherlands, New Zealand and Poland] competitors will accumulate points as they battle it out in a series of grueling events. An equestrian triathlon, the tournament will test the combatants' prowess and stamina as they pit themselves against each other in six events over the two day competition. Events include foot combat with axes, mounted melee, and four sessions of jousting.